Swimming pool is a place where people go either for learning how to swim or for swimming freely. Most of the people go to the swimming pool for their hobby. They spend a long time in the swimming pool water. They love to swim as well as to float on the surface of the water. In that case, it is essential for the swimming pool water to be free from algae and other dirt or garbage. A swimming pool also contains a charming view. It has a wonderful outlook. But algae in pool destroy the charm. So, its cleanness is necessary. Some centerpiece people have their own swimming pool. They should also know the procedures to prevent the algae in pool as well as the method to discontinue the growth of algae in swimming pool water. The swimming pool water should be sanitized to remove algae from water. In this case, a fruitful sanitizer is chlorine based swimming pool “shock”. It helps in raising the chlorine level of the swimming pool water. It is a rough form of highly concentrated chlorine. The raised level of chlorine in the water helps the algae in pool and other organisms to die quickly. If 1(one) dose doesn’t work well you can give another dose by increasing the rate. Brushing the walls and the floor of the swimming pool regularly helps you to get rid of the algae grows there. Even it is more useful than other techniques. There have no chance to grow algae in pool. So your swimming pool water would be very clean and fresh. Moving water is necessary for stopping the growth of algae in pool or removing it from swimming pool water. Cause algae grow in still water. So, keeps your pool water filtering especially in the rainy season. You can also get the help of speed pumps to flow the swimming pool water. pH level of swimming pool should be within 7.2 – 7.6. If, the pH level of your swimming pool remains within the range, it will help the chlorine to do its work properly. Than can not grow algae in swimming pool water. 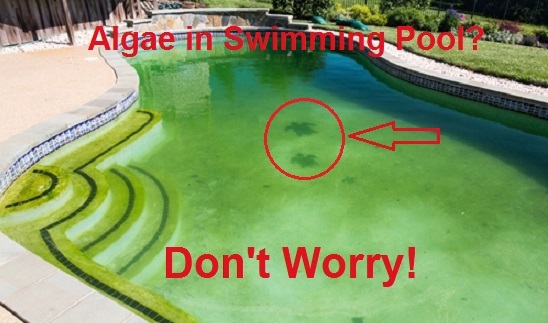 If you use your swimming pool occasionally or don’t swim much in it, then the chance of growing algae in pool is higher. Regular swimming with a longer time makes the swimming pool water free from algae and other debris. It works as filtering. When the algae are died, it takes a grayish or white color. Then it can be removed by vacuuming the pool. It should also be kept in mind that when you are vacuuming the pool, the filter should be washed properly. Otherwise, the dead algae trapped in the filter may come again in the swimming pool water. Here are the tips for you to keep clean your swimming pool water from algae. Hope that you will apply the methods and get algae free swimming pool water. But remember tat, Always natural ways is better than chemical way. 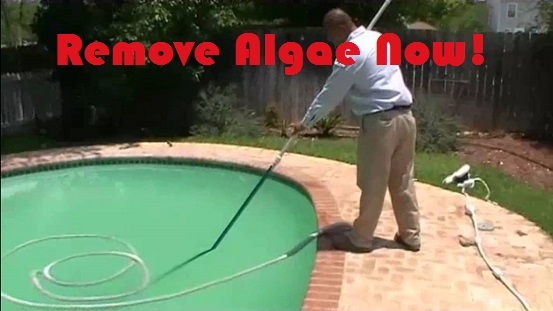 So try to apply all natural to remove algae from swimming pool water. Hope, you should not use any chemical way to remove algae. best of luck .